Pope Francis is a positive mojo machine. In fact, we consider him the patron saint of PR. Because of his overwhelming humility to be tangible and his undeniable ability to be liked, everyone wants a piece of Il Papa’s garment and a little of that Jesus blessing on them. Cagey. Effective. Almost begging. Did it work? Yes … and no. In case you haven’t been by a television in the past few months, Crowe is promoting a movie of biblical proportions — the story of Noah and his ark. Directed by the aforementioned Darren Aronofsky of “Black Swan” and “The Wrestler” fame, this looks great! So, of course, Crowe thought a skosh of star power in St. Peter’s Basilica would be impossible to resist. According to many reports, Aronofsky and Crowe attended a public speaking opportunity in The Vatican this week in hopes Pope Francis would rush to his Cardinals, grab some popcorn sprinkled with a dash of frankincense and myrrh, and go see a flick. “Not so much,” (or whatever that sounds like in Latin) if you asked The Vatican’s chief spokesman, the Rev. Federico Lombardi. He said Francis would not watch the film and Crowe would not be granted a private audience. 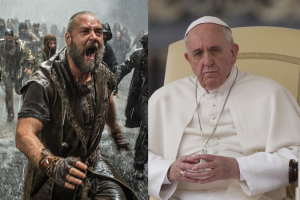 Deadline has learned that Noah star Crowe, director Darren Aronofsky and Paramount executive Rob Moore did in fact get to meet Pope Francis today, after the Vatican extended an olive branch and hosted the trio in the official VIP section of this morning’s Udienza. Despite this, people will gallivant two-by-two to see this when it opens on March 28. And since Crowe has been blessed, they may see it twice.